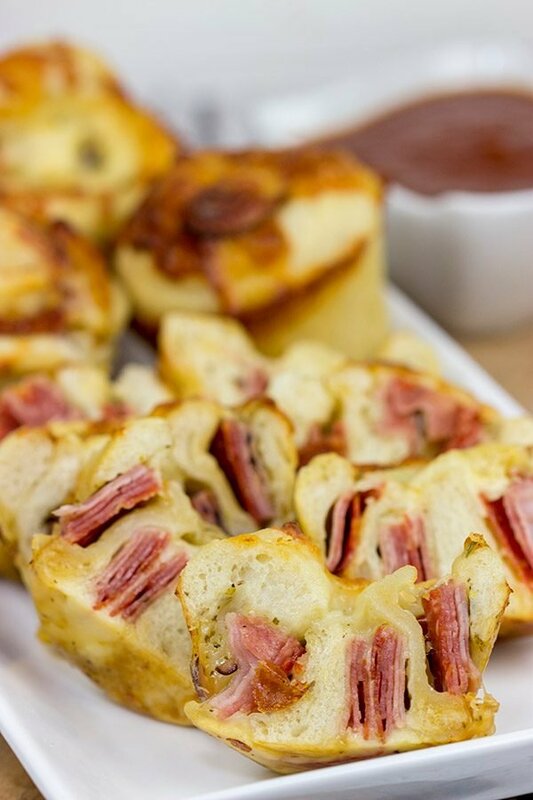 Muffin Tin Stromboli - A Delicious Game Day Appetizer! Muffin tins can be used for more than just breakfast! 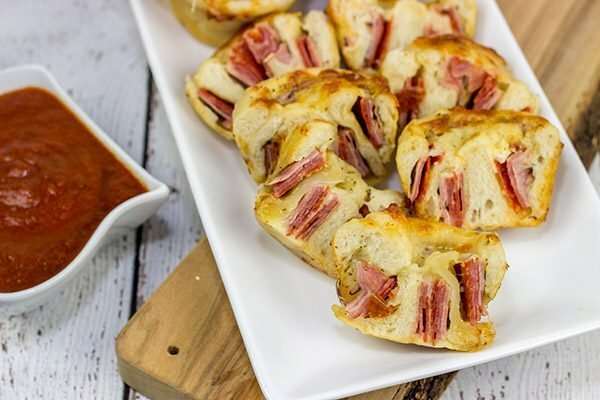 These Muffin Tin Stromboli are packed with Italian meats and cheeses, and they’re the perfect football appetizer! A couple weekends ago, Robbie and I spend 30 minutes sitting in the back of my car on the side of the road. And then we packed up and left. You see, we have train tracks that run nearby, and I’ve been tracking the Sunday morning train for probably 2 months now. I’ve seriously had a little sticky note on the corner of the kitchen counter where I write down the times when I hear the train whistle. I thought I had nailed it at 8:45am on Sunday morning. Thought is the key word here. We got to the train tracks and pulled off on the side of the road. (It’s not that busy of a road, and we’re able to get decently close to the tracks.) I got Robbie out of his car seat, and we sat in the back of my car waiting. And waiting. And waiting. Unfortunately, that 8:45am train never came. I don’t know if I got my times wrong, or maybe the train doesn’t come every weekend? I felt terrible as I had built this up for the lil guy. I’d told him all about how the crossing lights would flash and then gate would come down and then we’d see the train engine. But instead all we saw was a goose and 2 squirrels. We got back in the car and headed off to do our regular weekend grocery store run. I’ll try again next weekend with the train, though. I’ve loved trains ever since I was about Robbie’s age, and I know he’d love seeing that freight train rumble past. As we came back into the house from the grocery store, Robbie told Laura that we didn’t see a train. But he quickly followed that up with a conversation about the goose and 2 squirrels…so maybe our trip wasn’t completely in vain! Laura was helping me put away the groceries, and she came across the bag with all of the sliced meats and Provolone cheese. 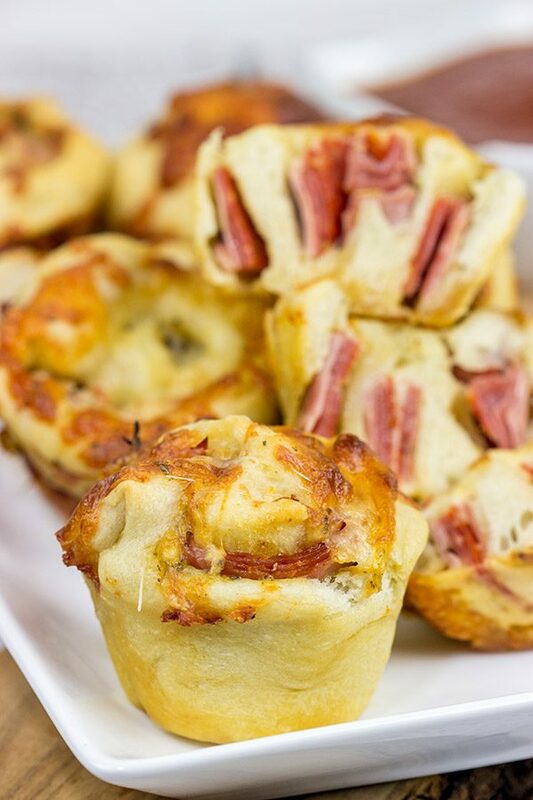 I believe her exact words were: “I don’t know what you’re making, but I know I’m going to love it.” We love Italian meats and cheeses around here, so it’s no surprise that these Muffin Tin Stromboli were a big hit! It’s basically pizza dough stuffed with delicious meats and cheeses, and it’s baked up in little miniature versions. These Muffin Tin Stromboli are a fun menu idea for the weekend, or they would also be excellent for nibbling on while watching football! I’ve made traditional stromboli a number of times, and it’s definitely one of our favorites. With the Super Bowl coming up (and then March Madness after that), I decided to transform that stromboli into a smaller version. Growing up, the muffin tin was always reserved for muffins and muffins only. But I’ve come to realize that muffin tins have much more potential! Don’t get me wrong. A good blueberry muffin is nothing to shake a stick at. In fact, I’ll polish off several of ’em! 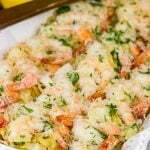 But muffin tins are an excellent option when it comes time for appetizer-sized foods. (These Muffin Tin Garlic Knots are another favorite around our house.) Enjoy, friends! Did you make these Muffin Tin Stromboli at home? Leave a comment, or snap a photo and tag me on Instagram (@Spicedblog)! Muffin tins can be used for more than just breakfast! 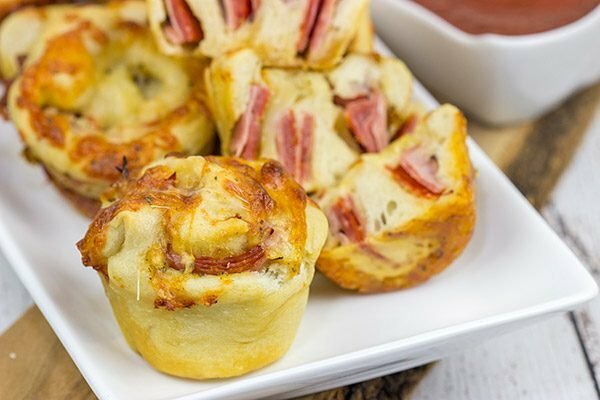 These Muffin Tin Stromboli are packed with Italian meats and cheeses, and they're the perfect football appetizer! Spray muffin tin with nonstick spray; set aside. Lightly dust countertop with flour. Roll dough into a 10”x12” rectangle. With a long side of the dough facing you, spread the pizza sauce (if using) evenly across pieces of dough, leaving 1” border on both of the longer sides. Next, spread 1 cup of mozzarella evenly across dough. Sprinkle Italian seasonings on top of cheese. Overlapping slightly, layer the ham, salami, pepperoni and provolone lengthwise down the dough. Sprinkle Parmesan cheese evenly on top. Starting with a long edge, roll the dough into a tight cylinder; pinch edges of dough to seal. 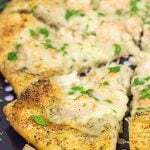 Using a sharp knife, slice the dough into 12 equal pieces. Place one piece in each of the prepared muffin cups. Bake for 15 minutes. Remove pan from oven and sprinkle remaining ½ cup of mozzarella cheese on top of stromboli. Continue baking for 13-15 more minutes, or until Stromboli are golden brown. As far as that train, it’s on the agenda! We keep hearing it go past in the distance, so one day we’ll get to see it. Cross your fingers for us, Sherri! Hi David! 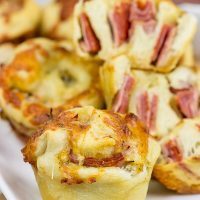 I love using a muffin tin to make savory foods and these Stromboli sound delicious! All the wonderful meats and melty cheeses wrapped in pizza dough YUM! You are always making things I would pig out on! That’s a good thing 🙂 Would a side of marinara be pushing it? Muffin tin meals are amazing, Dorothy! I’ve used muffin tins for rolls for about as long as I can remember, but I’m expanding into some new ideas now. These stromboli? Mmmm! And a side of marinara wouldn’t push this at all! In fact, Laura did that exact thing when we ate these. 🙂 You and Laura would be fast friends! We also love Italian meats and cheeses and this looks like a fabulously delicious way to eat them. I would love this would a bowl of hot soup. Perfect! Italian meats and cheeses hold a special place around our house, and these stromboli are a fun way to serve ’em. Thanks so much, my friend! Well at least you got to see “goose and 2 squirrels,” lol! These stromboli are so fun! Love the idea of making them in muffin tins. 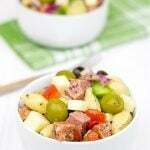 Perfect for game day fare! 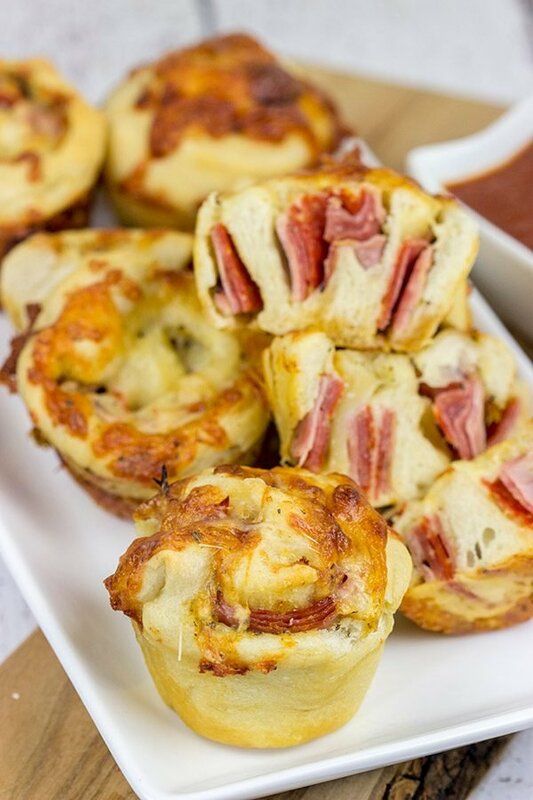 And stromboli in muffin tins are the way to go when it comes to gameday appetizers. These are so tasty!! Thanks, Marissa! Hey, I bet you were up at 8am when you were a kid. That’s what kids do…wake up early and want to play! Wow, that description of watching the trains on a misty day sounds amazing. In fact, I bet there are some really awesome photos out there. You should get one and frame it in your apartment! Oh wait, that’s something I would do. Haha. Or I might just have to come up there to see the trains and go curling as well! 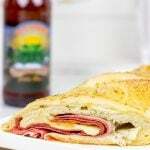 If you like Italian meats and cheeses (and I seem to recall that you do), then put these stromboli on your list! 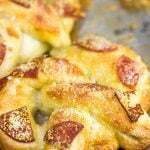 Or follow the link in the post to the more classic version of stromboli. Both are delicious! Thanks, Ben! Loving your muffin tin stromboli David! Yes, a muffin tin is definitely meant for other recipes, not just breakfast ones. Poor wee Robbie not seeing the train. As a train fan myself I know I would have been devastated. When I was young I collected train numbers and still have my trainset in a cupboard downstairs, although it hasn’t been put together in years. Still at least he saw some animals. I know too that I would have been happy with that! Off to print your recipe for my folder. I still have a train set packed away in drawers, too, Neil. I’m hoping I can finally set it up one day! Robbie got a bunch of Brio trains for Christmas this past year, and he loves ’em. 🙂 Maybe we’ll actually get to see that real train one day! And, yes, muffin tin meals (or appetizers) are the best! Can’t go wrong with some good Italian meats and cheeses, right? Hope you have a great weekend ahead, my friend! Oh well! Maybe next time? I don’t know if I’ve ever made stromboli, but I know I’ve been missing out! Love the idea of having little mini ones, though it’s pretty much guaranteed I’d eat more than one 😉 These make for delicious weekend eats, my friend 🙂 Have a good one!! Haha! Maybe next time. We’ll find that train yet. 🙂 So you totally need to learn about the wonders of strombolis, Dawn. Italian meats + cheeses are a surefire success! Hope you have a great weekend ahead, too, my friend! What fun! Kids and adults would love these equally! Great idea. What a fun idea – both the stromboli and the train watching. We have trains going by here at all times of the day. The best is when the ones go by carrying the fuselage to an airplane. I do love the sound of the train on the tracks. Hopefully Robbie will get to see one up close soon! No way! That’s so cool that trains carry the airplane fuselages near your place…that would be awesome to see. You should take a photo for us! 🙂 And, yes, there’s just something so cool about hearing freight trains rumble past. In another life, I think I could’ve been a freight train conductor! Hope you have a great weekend ahead, Kathy! These Stromboli look amazing, my friend! 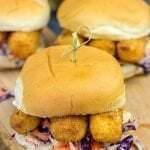 I’m so hungry for one of them right now! My family loves it when I have snacks stashed away for late night snacking. These would be a huge hit! Oh man, these stromboli are so tasty, Kelly! We’re all about football (and basketball) foods around here on the weekends…and these stromboli were a huge hit. The muffin tin was a great way to bake ’em up, too. 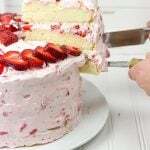 Hope you have a delicious weekend ahead, my friend! Can you believe I’ve never had Stromboli? I recently realized I’m Italian food deprived, pasta especially because I’m always watching my carbs. But those days are quickly coming to an end. The older I get the more I realize none of it matters and a little pasta never killed anybody. I’m sorry you guys missed the train, but it sounds pretty darn adorable. No way! Ok, you’ve got to fix this stromboli problem ASAP, Mary. We live by the “everything in moderation” rule around here. We eat pasta. We eat bread. We eat desserts. But we also work out, and we try to balance how much of those things we eat. It works for us! Oh he will definitely see that train sometime! At least he was happy with the goose and 2 squirrels, though. 🙂 Also, these muffin tin stromboli? So good!! Thanks so much, Karen! David, if you and Robbie love trains, you’d love our back garden as it backs up to 6 tracks, which have trains flying by about every 15 minutes. We have the local Skåne commuter train, Denmark to Sweden commuter, the X-3000 trans-Sweden highspeed train and plenty of freight trains. Our trains are electric so no smell and they rarely blow their whistle, which is a good thing. What a great idea your Muffin Tin Stromboli is and one I’ll be putting into play soon. Thanks for the inspiration.